Football Honors: Three-year varsity letter winner for the Wildcats and coach David Crail ... Helped River Falls to the Big Rivers Conference championship and a WIAA playoff berth as a senior, recording 52 tackles from his defensive back position ... Ranked second on the squad in tackles heading into the second round of the WIAA playoffs ... A 6-foot-3, 200-pound defensive back/wide receiver. 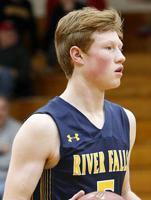 Basketball Honors: Honorable mention all-Big Rivers Conference pick as a junior after helping River Falls to a 15-9 record under coach Zac Campbell ... Averaged 6.6 points and 4.9 rebounds during the 2017-18 campaign as the Wildcats went 8-4 in league outings ... Set the River Falls single-season assist record ... Two-year varsity performer heading into his senior season and one of four returning starters along with Michael Vitt, Payton Flood and Zac Johnson. Baseball Honors: First-team all-league pick in the Big Rivers Conference as a junior infielder for coach Ryan Bishop and the Wildcats ... Second-team all-conference selection as a sophomore, helping River Falls to a 9-8 record in each of the past two seasons ... Second-team all-Region choice as a junior. Favorite Sport: "Baseball because you get to compete, but the environment is very relaxed." Best Part of High School Sports: "Competing with people you've grown up with and the opportunity to represent your own town." Best Advice from a High School Coach: "Trust in your abilities." Most Memorable Moments in High School Sports: "Making the WIAA playoffs in football." Best Part of Playing Three Sports: "The opportunity to compete year round." Toughest Part of Playing Three Sports: "Finding time to do other things." I Find it Relaxing to: "Play video games." Family Members: Jeff, father; Paula, mother; Mitchell, brother.